The Classic Brunette: The Classic Brunette's Beauty Birthday Giveaway! This giveaway was originally going to be a celebration for reaching 10K on Instagram, but I was approached to do a few smaller giveaways right around then, so I pushed it to today. I decided to give some love back to all of you who've supported me and my blog with a fun giveaway! A few weeks ago I set up a poll on my Twitter asking what you all would like to see in a future giveaway, and beauty products was the #1 answer. So here it is, my big beauty giveaway for you all! Note two of the items in this photo have been removed from the giveaway since they broke! All things listed below are included. Here's what you'll get if you're the lucky winner! FYI this giveaway is in no way sponsored by anyone but myself. This Giveaway is valid in the Continental United States Only and Entrants must be 18+ years of age to enter. This giveaway event will end at 11:59 PM (EST) 2/15/17. Winner will have 48 hours to respond to my email or I will pick another entry. Good luck everyone! Happy 22nd birthday!! What a great giveaway :) I would definitely love to do something like this on my blog at some point! Such a great way to say thanks for your followers:) What are your plans post college? This is AMAZING! I want all the masks! All of these sounds great, but the hair mask sounds wonderful, a curly hair necessity! Such a great giveaway! Happy birthday Sami! I'm excited to enter to win the leave in hair treatment. My ends are dry from all the curling I've been doing. So it would be great to give my hair some TLC. Excited to see what your 22 has in store for you! There SO many products here I've been dying to try! Elf eye shadow palettes are my guilty pleasure. This is an awesome giveaway who ever the winner is, is lucky. I want all of the items in there. I love how you did a Twitter poll to see what your followers would want in a giveaway! What a great idea! It would have been bad if I was giving away something no one was interested in!! Lol! This is awesome, Sami! What's even more awesome is that you hit 10K on Insta! Congrats girl! Oh, and Happy Birthday! Thank you so much Caitlyn!! Happy Happy birthday! That eyeshadow palette is so pretty, and probably what I'd want to win most! The eye shadows!! They're so pretty & I love elf! Happy birthday! A giveaway is such a sweet way to celebrate it! There are so many fun things in that basket, you are going to make some girl very happy! Love it! That eyeshadow palette is screaming my name! Love giveaways! So excited for this! What a great giveaway! I'd be most excited about winning the Falsies mascara! It's my favorite!!!! I'm feeling a little lucky considering we have the same name! Fingers crossed! Sooo many amazing products but I've been really interested in the Glossier highlighter! All the skincare products are AMAZING - also Glossier is something I've been wanting to try! I'm the WORST when it comes to make-up and there is such a learning curve/budget adjustment. Happy birthday! 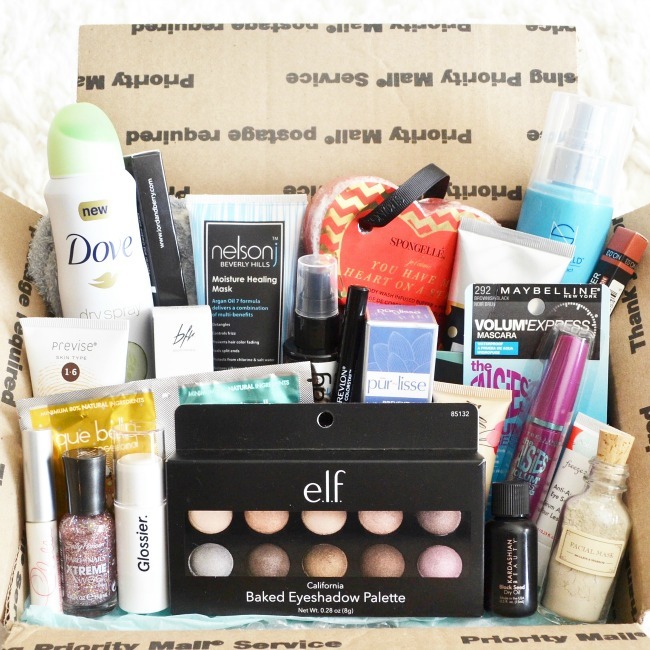 What an amazing giveaway ♥ Those products are all absolutely amazing. The eye shadow palette has great colors! I am most excited to try the Maybelline Volume Express Falsies Mascara, Nelson Beverly Hills Moisture Healing Mask, and Previse Hydromilk Moisturizing Lotion. My skin suffers during winter months, so I am always looking for moisture miracles. Thank you so much for the chance to win such a lovely and generous giveaway. Either of the two eye serums would suit me. Winter has not been kind. I'm most excited about the Coolway Hair Leave-In Treatment -- I've been looking for new hair products and this one looks good. I am really excited about the eye shadow or the eye serums!! Im super excited about the Freeze 24-7 Anti-Aging Eye Serum. This is the ultimate beauty giveaway!! Everything is SO good - I would love to win! I would be most excited about the falsies mascara! I've heard so much about it but haven't had the chance to try it yet! Hard to choose just 1, however, I would absolutely love to try the Spongelle! Everything sounds so great. My wife is very excited about the Previse Hydromilk Moisturizing Lotion.